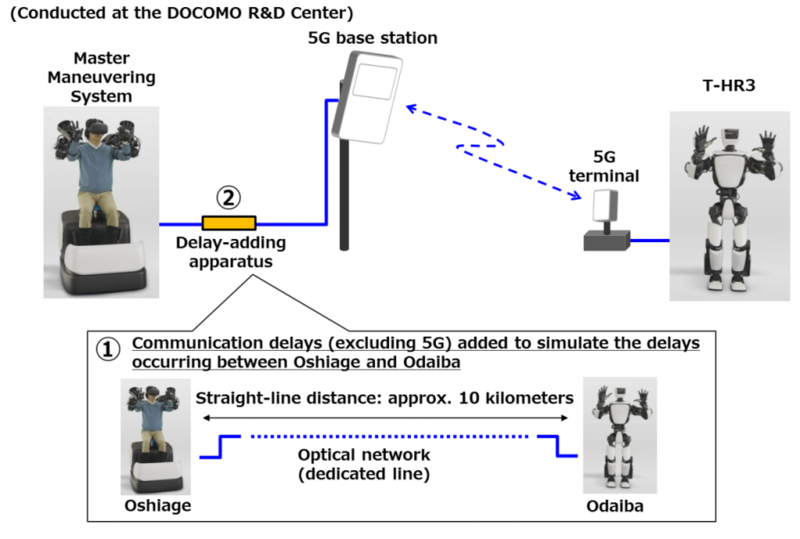 NTT DOCOMO, INC. (DOCOMO) and Toyota Motor Corporation (Toyota) today announced that they have successfully controlled the Toyota-developed T-HR3 humanoid robot in trials using fifth-generation mobile communications (5G) under a test environment with control from a remote location (a distance of approximately 10 kilometres) using 5G in an area between two points. Toyota developed the T-HR3 with the aim of creating a partner robot that can safely support human activities in a variety of circumstances, such as homes and healthcare institutions. By employing Torque Servo Modules that control torque (power) and a Master Maneuvering System that allows the robot’s entire body to be operated at will, the operator can feel external forces exerted on the T-HR3 and prompt it to move in the same manner as them. DOCOMO and Toyota plan to demonstrate the technology between Tokyo Big Sight and Tokyo Skytree as part of the DOCOMO Open House 2018, which will be held at Tokyo Big Sight over two days starting on December 6, 2018.